The might of the pen! Home > Campus News > The might of the pen! 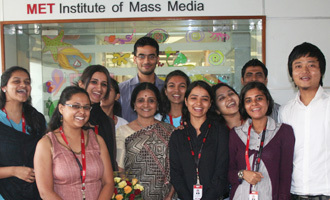 A columnist, a critic, an author and a showbiz consultant, Bhawana Somaaya visited as a guest faculty at MET IMM to train the aspiring journalist through her experiences. She is a renowned film journalist since almost three decades. She has penned columns for The Sunday Observer, Afternoon, The Hindustan Times, The Hindu and has made a mark for several other news papers and magazines.